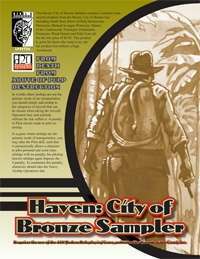 The Haven: City of Bronze Sampler contains a samples from several products from the Haven: City of Bronze line including Death from Above of Pulp Destruction, Prototype: Masked Avenger, Prototype: Master of the Underworld, Prototype: Ubermench,Prototype: Witch Hunter and Pulp Feats all for the low price of $4.95. This product is great for those who want to try out the product line without a huge investment. This title was added to our catalog on January 29, 2007.